One of my favorite events of the year is coming up shortly! This event is the one and only OC Fair that takes place every year at Orange County Fairgrounds located in Costa Mesa, California at 88 Fair Drive, Costa Mesa, California 92626. Every year I have loads of fun at this fair and have been going since I was a small child and grew up in the area! Filled with delicious foods, rides, games, competitions and more, the OC Fair is the place to go! The fair will be taking placer from Friday, July 11 – Sunday, August 10th this year and it will be a blast! FREE admission and 1 carnival ride per person every Wednesday with donation (donation changes weekly). Look for Olivia for special shopping deals with select vendors all day. Catch the OC Fair Express at one of the eight convenient locations in Orange County with direct bus service to the OC Fair and save! OC Fair Express which provides direct bus service to the OC Fair. Just show your valid Metrolink ticket for a FREE ride to the OC Fair. If you like contests and great food and live in the OC area, feel free to also check out my contest currently going on to win a $50 gift card to pick up some take out from the delicious SOLITA in Huntington Beach. Here is the link to go the article, read about it and enter: WIN a $50 gift card from SOLITA. This looks super fun.. 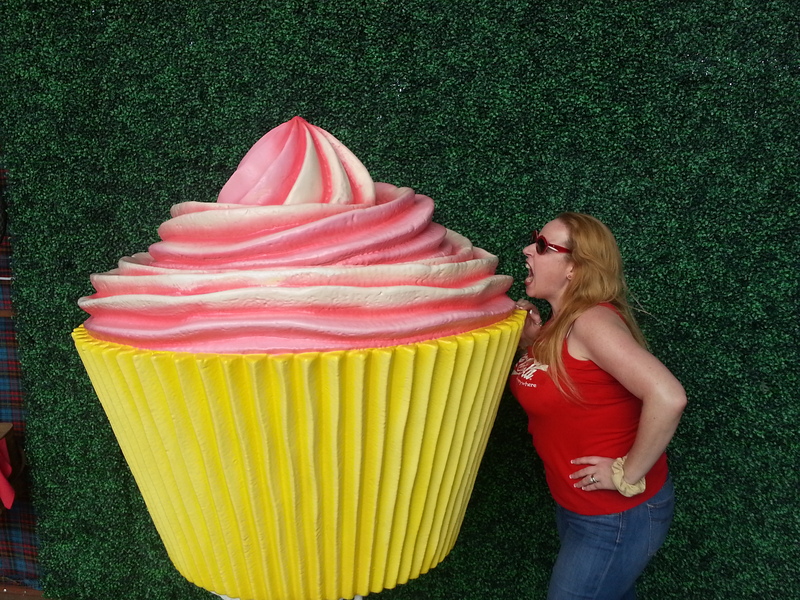 I would l like to eat the big cupcake! 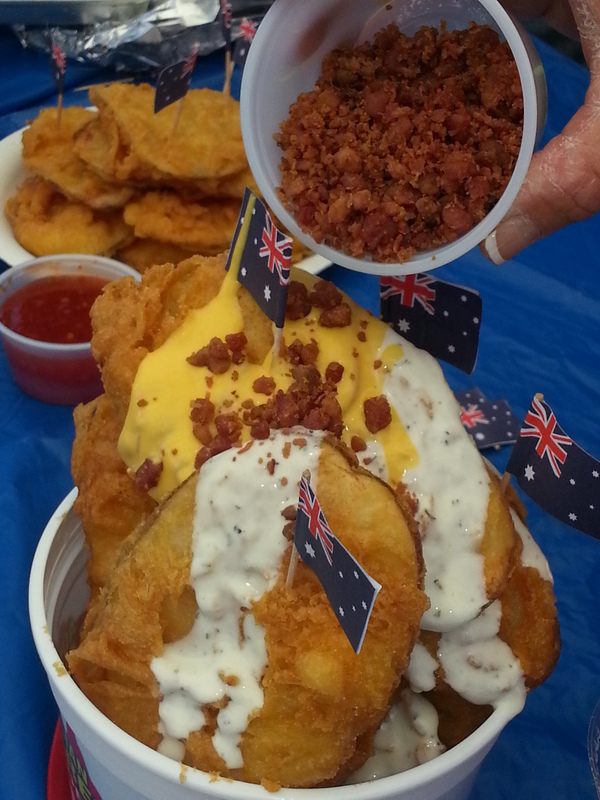 Those Australian battered potatoes sound like a great reason to go to the fair! There is always something for everyone at the fair! 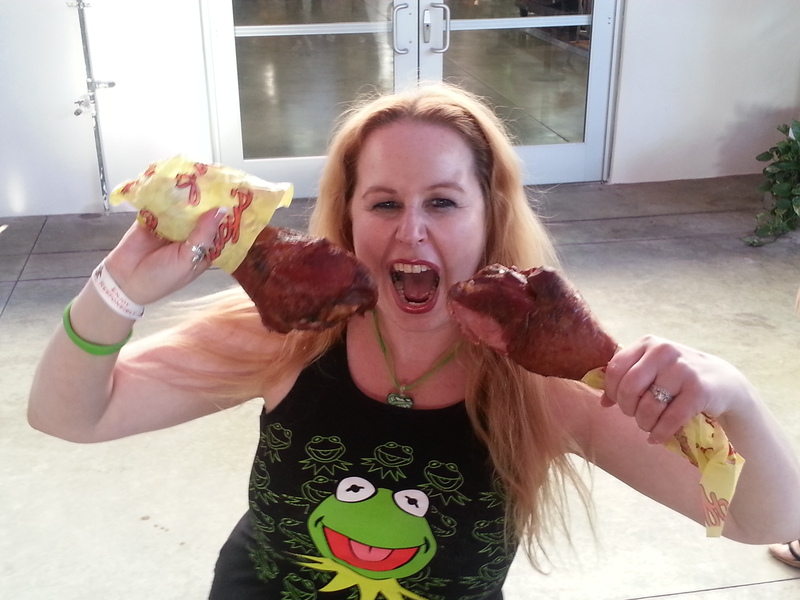 LOL…I love your turkey leg comment but I must say the turkey legs I get at the OC Fair are moist and juicy…no stringiness allowed! I love going to the OC fair! It is a lot more fun when you are saving money, Great picture with the goat! Thanks Tommy. I hope we get to visit with a friendly goat like that one again this year! Sounds like some great summer fun! Great deals you’ve shared with us. I wills share them too. Nice deals here. I really enjoy going to the fair. Thanks Casey! Have fun at the fair. Perfect event to join this summer! It will be fair time soon where I live. I love taking my kids to the fair! So much fun! Thanks for sharing these deals! I love the Fair! My family goes every year to try out the awesome food!! Love the food! Especially the corn on the cob!!! fan too! Going to get the new churro this year and I know something bacon! I have never been there! It looks so much fun. I really wanna go! It is a blast! Best fair ever:) Good luck! Always a Corn dog, tradition. Thanks so much Elizabeth. We will try to make that! It sounds so fun! 🙂 Have a fabulous weekend! Thanks for all the info! I’m thinking of buying a pass but there are some really great deals. I donated some books last year, might do that again this year. I love the fair! Every year we have to ride the ferris wheel. I think I’m stuck in the rut with Pink’s hot dogs. I’ll have to branch out this year and try a turkey drumstick or the Australian potatoes. Thank for the info! I can’t go without deep fried Oreos! Those are pretty delicious! Have fun! I haven’t been to the OC Fair, but I’ve seen/read/heard about all the delicious food. Hope to try some of it! Funnel cake and turkey leg are my favorite fair foods! Thanks for the ticket giveaway, Dani! I haven’t been to the fair in many years. I love the variety of food items though. The only place that I loved all the fried food. I love it:) Good luck! I haven’t been, but I love fair food and my absolute favorite is funnel cake, on the onion bloom! YUMMM! I went last year for the first and LOVE IT. It was so much fun and so many yummy food. I like their turkey legs and I want to try some of the deep fried food. I love the deep fried Oreos. nope but i did the sd fair this year. i love the deep fried oreos!!! I have never been to the SD Fair. How was it? 🙂 Those oreos are a great choice! 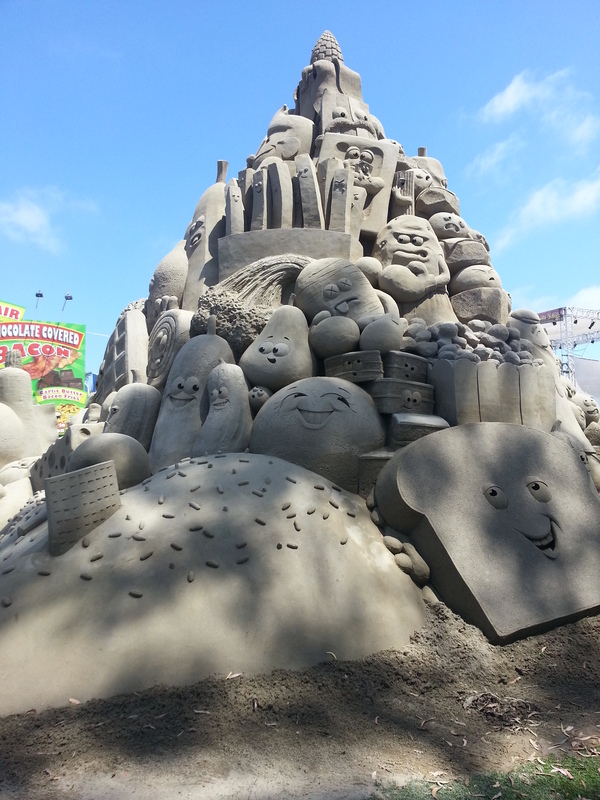 I’ve been to the fair before, and my favorite thing to eat are the Australian potatoes! Those are a great choice! Good luck Chau! I love to get the chocolate covered bacon bring it home to top my chocolate cupcake with maple icing! 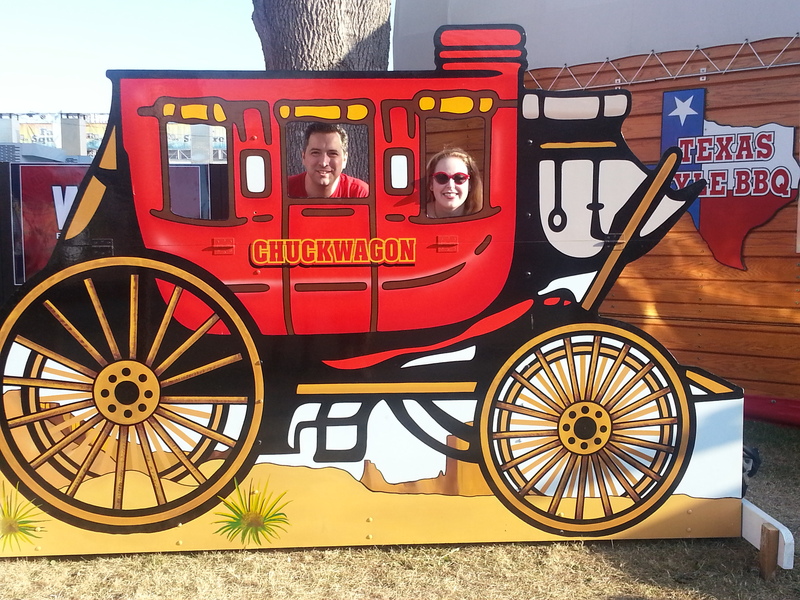 The OC Fair is so much fun for the entire family! Tasty Chips and the corn are the best! I love this fair. My dad has been going for about 40 years and I be been going all my life. Very cool Samantha! I have went my whole life as well! So many great memories there:) Good luck! Funnel Cakes!! Every visit to the fair calls for a Funnel Cake and Turkey Legs. My son loves the giant corndogs, and my husband loves anything barbecued. Fun times at the fair! For sure:) Good luck Heather! Have fun! I love the OC fair! Would love to win this for my daughter to be able to go! By the way-my most favorite fair food is the deep fried avocado. So delicious! Isn’t it so fun? I am with you….loves loves loves it! 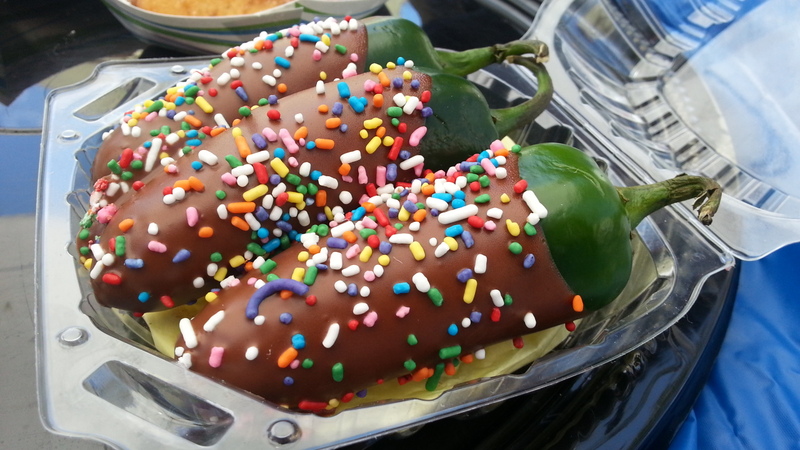 Those deep fried avocados are pretty amazing…I must agree! Good luck in my contest! This would be awesome! I have a gaggle of kids and the prices are crazy for rides this year! You have to try the mexican funnel cake. Churro batter shaped like a funnel cake topped with strawberries and whipped cream. It’s the ONLY reason I go to the fair! I’ve never been to the OC fair! Sounds like fun!